This tutorial briefly explains about Hosted CRM (Customer Relationship Management), How hosted CRM is beneficial for small and large enterprises. What is Hosted CRM (Customer Relationship Management)? A hosted CRM is a service application that runs on the cloud, therefore, it doesn't need any company server, Hosted CRM allows user and companies to install help desk for their customers without configuring any software. Hosted CRM can also be referred as an arrangement in which a company has outsourced either some or all its customer relationship management functions to an application service provider. The hosted CRM model is believed to substantially increase the return on investment and this done by decreasing the costs and thus allowing a company to focus more of its resources on the core business areas. On the other hand, the In-house CRM, while being more expensive, allows more customization to be done. 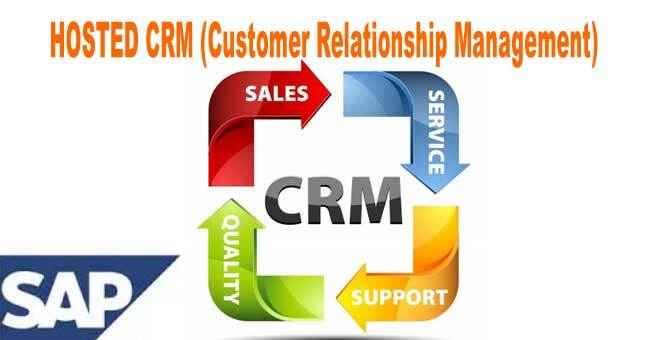 Few companies which offer hosted CRM are UpShot, Siebel, and Salesforce.com. The hosted CRM model is by far one of the most commonly used in small-to-medium size companies, especially in those companies which do not already have a well-established CRM process. As per a study from Nucleus Research, more than 80% of companies which have outsourced CRM did possible achieve a positive ROI. The study mentioned that the problems with the traditional in-house CRM model included poor management, consulting costs and software which were extremely high, apart from the ineffective user adoption. A hosted CRM is quite useful for small-to-medium size companies where an in-house CRM process hasn’t been installed. A hosted CRM is far better for a small business organization as compared to going in for a well-established CRM solution as that will be expensive for the firm. Additionally, the hosted CRM products are comparatively easier to be used than the individual CRM solutions. It helps in increasing the return on investment (ROI) which is made by reducing the cost and thus allowing the company to invest more resources on the main business line. The large firms also prefer to use the traditional model of in-house CRM, as it can be customized easily as per the needs of the company. One of the major drawback of hosted CRM is that most data of the company is in the hands of a third party. Inspite, of the installation being easy it requires significant IT resources, infrastructure, and time to be deployed. Few of the other drawbacks include control of data, integration with other applications, lack of customization and storage on third party. Quite a few companies opt-in for hosted CRM primarily for evaluating their capabilities before purchasing an in-house CRM. The decision of selecting a hosted or in-house CRM depends on the customization requirements, overall size of the business, budget, Strategy of the technology, and the industry wise sector requirements. Many large companies opt-in for the traditional model, because the in-house CRM can be specifically tailored e specifically to the particular needs of an organization.